It’s a bad end to a bad week for the British military. THE British Royal Navy faces a possible multimillion-dollar repair bill for damage to the world’s most advanced submarine, with stealth technology so sophisticated it can lie undetected for weeks off an enemy coast. The sub, which is so new that it is not yet fully operational, has sonar with a range of 3000 nautical miles and carries more firepower than a squadron of 16 Tornado bombers. But on Friday the £1.2billion ($1.9billion) HMS Astute nuclear submarine spent the day stuck on a shingle bank near the Isle of Skye off the west coast of Scotland in view of a curious public after it ran aground during a routine crew transfer. It was towed free by a tug that night but the incident is another blow for the Royal Navy, which suffered considerably last week with budget cuts to its aircraft carriers, warships, Harrier jump jets and the prospect of 5000 redundancies. The navy insisted that there was no likelihood of a nuclear leak or any other environmental issue and no one was injured in the incident. But the ship’s Commander, Andy Coles, will face questions and a possible court martial over why the ship ran aground. Well, at least they got her back underway with no apparent damage and no loss of life. A beer served in bottles made from stuffed animals has been criticised as “perverse” and “pushing the boundaries of acceptability”. The End of History, made by BrewDog of Fraserburgh, Aberdeenshire, is 55% and £500 a bottle. 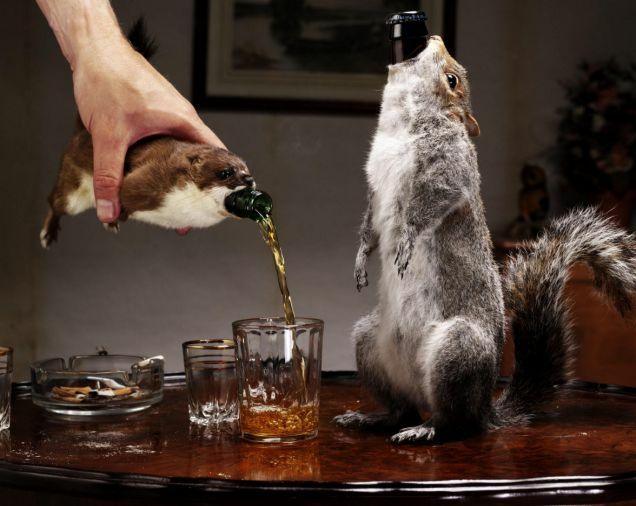 The bottles have been made using seven dead stoats, four squirrels and a hare, said to have died of natural causes. However, Advocates for Animals and Alcohol Focus Scotland both condemned the marketing. BrewDog claims the beer is the world’s strongest and most expensive. Much as I’d like to try a beer with 55% alcohol content, served in a squirrel, I think I’ll stick to Michelob Golden Draft. It’s official, you can now feel free to count your chickens before they’re hatched. British scientists claim to have solved one of the great mysteries of life, the universe and everything in it: The chicken came before the egg, they say, and they’re not mincing words. “It had long been suspected that the egg came first, but now we have the scientific proof that shows that in fact the chicken came first,” Sheffield University’s Dr Colin Freeman, according to a report in the Metro. Researchers from Scotland and England used a supercomputer called HECToR to look in such detail at a chicken eggshell that they were able to determine the vital role of a protein used to kick-start the egg’s formation. That protein is only found, wait for it… inside a chicken. Freeman, who worked on HECToR with counterparts at Edinburgh’s Warwick University, said the protein had been identified earlier by scientists and was known to be linked to egg formation, “but by examining it closely we have been able to see how it controls the process,” he added, describing it as a catalyst. Professor John Harding, who also took part in the research, told Metro the discovery could have other applications. “Understanding how chickens make shells is fascinating in itself, but can also give clues towards designing new materials.” he said. Which is good, because in spite of HECToR’s hard work and the “scientific proof” it yielded, the study offered no explanation as to how the chicken got there in the first place. If not from an egg, perhaps it just came from across the road. Which came first, the chicken or the egg? The chicken, researchers say! Which came first? The chicken, not the egg!